David Beckham Used To Play Football Y’Know? That’s it then. David Beckham has moved clubs for the last time in his playing career, if you believe what you read. His move from Real Madrid to LA Galaxy has been announced with almost as much fuss as the reaction that greeted his move from Manchester United toSpain. Years ago I spent some time working for a newspaper in the North West, inBlackburn, of all places. On the desk next to mine sat the sports photographer who figured out I was a Man United fan and thought I’d be interested to know he had just been to Bisham Abbey to photograph the new England caps. You will know the pictures if you see them, Gary Neville and co in horrible burgandyEnglandjumpers holding the flag of St. George. He gave me the David Beckham one and said I could keep it, I still have it, he said the lad would be worth watching. By then I’d been to Old Trafford to know he was worth watching. Author SMPosted on January 7, 2007 August 17, 2013 Categories Opinion, Real Madrid, TransfersTags David Beckham, Sir Alex FergusonLeave a comment on David Beckham Used To Play Football Y’Know? Our Arse Dent’s On The Premiership Sofa Now, Jose! This site is updated regularly but not merely to post what happened in the match before it. If there is nothing to say, there is usually no update but I couldn’t let this day go without one. It is, after all the last day of the year and Alex the red nosed manager’s birthday so if nothing else it’s worth a bookmark because of that. Then, I’m watching that once great institution ‘Match of the Day’ on the BBC and I’m suddenly inspired to write. A few things gave me this inspiration, namely that Alan Shearer, ‘the Mary Poppins’ of football, was forced through gritted teeth to pay compliment to our tricky Portugeezer Cristiano Ronaldo. Regular readers will know I am a fan, nothing more needs to be said about the man today. Author SMPosted on December 31, 2006 August 17, 2013 Categories Opinion, Reading FCTags Cristiano RonaldoLeave a comment on Our Arse Dent’s On The Premiership Sofa Now, Jose! It’s Not the Size of the Gap, It’s What You Do With it That Counts! In this, the season of good will to all men and fellow supporters in this wonderful league of ours, I thought I would make a return to Mancunia to say thank you to all the rival fans for their reaction to our own Cristiano Ronaldo. After the world cup we wondered if we had seen the last of Ronnie in United red. So did Sir Alex, according to an exclusive interview done by Rollin Reds (the magazine for United’s disabled supporters), after that incident he was texting Cristiano and receiving no reply. Fergie feared the worst, agents getting involved, not being able to speak directly, the news was saying that Ronaldo was ignoring his club and for a second Sir Alex believed it. Then he realised that he had been texting his old number!!!! When he did get in contact with him it was clear there was never any intention to leave our club, and so he just had to prepare himself for the reaction from rival supporters. 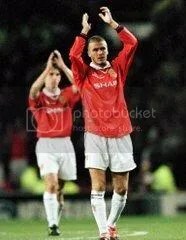 We as United fans have been through this before with David Beckham and we watched him grow and grow into a player that the world would know. Ronaldo is following the same path (by all accounts a move to Real Madrid at some point wouldn’t be too out of the question for him either) and the lad seems to thrive on all the boo antics. Against Aston Villa he scored a goal didn’t look too far removed from one that Ryan Giggs may have scored a few years back, or George Best (back when he could be arsed to play) and all round he is playing the best I have seen from him. Author SMPosted on December 26, 2006 August 17, 2013 Categories Opinion, Premier LeagueTags Cristiano Ronaldo, Jose MourinhoLeave a comment on It’s Not the Size of the Gap, It’s What You Do With it That Counts! …Than Be A City Fan! Job done in the derby, Stuart Pearce tried some half arsed mind games with his “this means more to City fans” comment. I think he was right, though not for the reason he thought. It meant more to City fans because it was one of their two chances each season to drag themselves up and feel good but for us it was just another hurdle in our way, the opposition did not matter. I was not as geared up for aManchesterderby so much as I was for the chance to put Chavski under a little bit more pressure than usual. Slick Rick Jose said there was no pressure and that it was a fake table because they have games in hand. Funnily enough I remember another such occasion when the tales were reversed and we had games in hand and Jose stood there cool as ice and said that games in hand did not matter, to have the points in the bag was the main thing. What a difference a year makes. Managers everywhere are guilty of the rose coloured spectacles on some days, Arsene Whinger more than most and much as I like Jose, it’s nice to know that we are messing with his head if only a little bit. Cristiano Ronaldo and Michael Carrick deserve mention from Saturday, they both continue to impress me in their roles and Carrick spread a few passes around as yet more proof that he is settling in. Ronaldo’s supply is better than it has been and the end product is there. It wasn’t one of Wayne Rooney’s great games but on his worst days he is better than many rival players so he can still add to our team. For one brief moment on Sunday I began thinking that it would be possible for Arsenal to do us a huge favour. I didn’t expect anything for them fromStamfordBridge and fully expected the gap to be closed by a maximum points haul from that lot, starting with the Gooners. However, Arsenal went for it and at least caused a stumble in the Champions. Credit where credit is due their equaliser was some goal, and a two points dropped is better than nothing. I think that Jose’s post match comments were interesting, telling everyone who would listen that the gap would be five points on Thursday morning and that Newcastle, as good as they are, should expect a spanking. I agree with Jose, Newcastle will crumble. Author SMPosted on December 11, 2006 August 17, 2013 Categories Man CityTags Jose MourinhoLeave a comment on …Than Be A City Fan! We Benfi-Can’t Keep Doing That! Manchester United played brilliantly last night, kept Benfica under pressure and their ‘keeper busy and it was a brilliant performance…eventually. Not for the first time I was sat there thinking that the visiting team could do us a huge favour and score first, which thankfully they did. That goal, great as it was, allowed the real Manchester United to emerge; the team that stopped arsing around with 4-5-1 and Rooney wide or whatever the formation was, the team that took the game by the balls and didn’t let go until we had scored to draw level. Manchester United are a team that makes it hard, maybe because it makes it more memorable when we get to where we want to go but half the time I feel like throttling them when they play like they did in the first twenty minutes. Who are Benfica to come to our home ground, and have time and space to pick out passes? Getting us through last night, eventually as group winners, was the most important thing. Sir Alex could mess with 4-5-1 when we were five nil up and playing the ole football. All things said, that is exactly what happened. So we can put the ECL to bed now for a few months and concentrate on consolidating our lead at the top of the Premiership. Let’s all breathe a collective sigh of relief and admit that eventually the passion and play was as good as we wanted. Phew! Author SMPosted on December 7, 2006 August 17, 2013 Categories European CupTags Nemanja VidicLeave a comment on We Benfi-Can’t Keep Doing That! Can I Boro a Feeling? Ronaldo, contact in the Area and United taking the easy road for once? Making things easy for themselves. Manchester United have never been very good at that through history. Juventus, away, in the Semi Final in 1999 anyone? It turns out that hauling ourselves back from the brink of the exit was good for us; the goals we scored to equalise put us mathematically in a better posisition than we were because of the away goals and all that jazz. Bayern Munich in the Champions’ league final, do we take the lead? No. Do we score an equaliser quickly when they take the lead? No. We wait and produce the two single greatest minutes in any organised football match ever, and we win the match 2:1. Remind me, who put the ball in the Germans’ net? Author SMPosted on December 7, 2006 August 17, 2013 Categories Premier LeagueTags Cristiano RonaldoLeave a comment on Can I Boro a Feeling?